McCabe, a Y Combinator alumnus from her previous startup Contagion Health, said her time at Romotive made her realize the need for better early-stage investor resources for startups working on hardware projects. 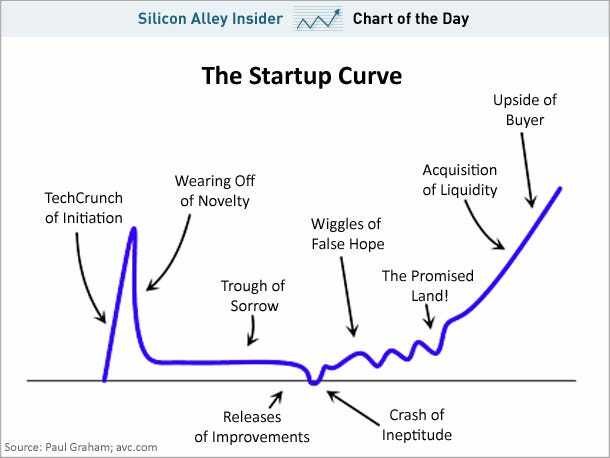 In particular, she realized that entrepreneurs needed more help getting through the trough of sorrow/despair, a reference to the discouraging downturn section of Paul Graham’s Startup Curve model. “For software, [the trough of despair] is hard, but for hardware, it’s wicked,” McCabe said in an interview. There’s an initial high that comes with the launch of a startup’s first product, but it’s quickly followed by the challenge of building more units, finding new distribution channels and coming up with a second product. After she started working with Hsieh and Nimbus, McCabe found that, outside of production issues, the single biggest complaint founders had was that they didn’t have investors that understood hardware and the unique problems it faces. Hardware is currently experiencing a renaissance with the help of the rise of crowdfunding and a decrease in start-up costs. However, many of the most popular projects on Kickstarter and Indiegogo have had trouble meeting their own deadlines. Working independently, each batch of hardware founders would have to reinvent their own wheels, but organizations like VegasTechFund and Haxlr8r are working to pass along valuable knowledge to early stage companies. My reason for being is to be a functional, useful hardware investor, so that when I talk to these founders we’re talking about how they make an early stage operations hire, how they work with outsourced industrial designers, the dangers of injection molding, [etc]. Our goal is to get these startups through that trough of utter despair as they try to build to scale. It’s very rewarding work to see something that you’ve built, a physical tangible object. To see a team go through the process of a design together and then put it into the hands of customers. There’s something about backing a team that’s building something real. I hope more investors will see that. According to McCabe, software projects have evolved with very set paths in recent years. A couple of founders might work on a minimum viable product, find some seed funding, join an incubator or accelerator, then raise a small amount of investment. Typically by that point, they have a sense of whether they’ll scale, fail or become a lifestyle business. The hardware process is also replicable, but there isn’t as much information out there for new entrepreneurs. “The biggest challenge is getting that first time product launch experience. You have to work in a much more rigorous way,” McCabe noted. For instance, hardware projects can’t just slip on deadlines because it will offset the factory schedule and distribution timing. McCabe went on to outline the five components she believes are critical to having a shot at success with a hardware startup. First, companies need to start with a customer- and market-driven design process. “Know what category of product you’re competing with going into it, where it’s sold, and what price point, what customers might buy or use instead,” she recommended. As companies move on to the building phase, cheaper prototyping methods offer startups an advantage. Resources like TechShop, 3D printing and incubators, have greatly simplified the process. After you’ve designed a product for a customer, you have to push it through a really appropriate sales channel. A lot of hardware begins in preorders like Kickstarter and Indiegogo campaigns, but that can’t end there. They need to push themselves beyond direct sale or web orders. The likelihood that a startup will sell more than 10,000 units on their website is slim. On Amazon, Brookstone, or Apple.com? Much more likely. Next up, hardware startups have to actually ship devices out to customers. It’s a “time-honored, proven process” as McCabe put it, but it also includes a lot of surprises for first-time entrepreneurs. For instance, startups might not know that putting over 35 pounds of product in a master carton incurs a forklift charge. Or, they might be unaware that they need to budget 8-12 weeks for the necessary GS1 barcodes. “It’s those things that you only learn by experience, the hard way, but once somebody you know know those things, you don’t have to fail,” she said. Service will save you as a company if your ship date is late. If you’re customer driven, honest with the people who are supporting your company, then they’ll be patient with you for the most part. But, if you forget about service and something happens, you can’t ever recover that first chance at a good relationship. Taking care of customers could be as simple as having someone route a 1-800 number to their cell phone via Grasshopper, keeping an eye on the firm’s Facebook and Twitter accounts, or answering support emails and passing messages along to the software and hardware teams. With smartphones reaching near-ubiquity among tech consumers, McCabe believes hardware’s time has come. I asked how those categories played out in VegasTechFund’s own investments. McCabe mentioned Beep, a startup making a wireless streaming device and platform that just launched, as an example of one such new product experience. She said that the first time Beep co-founder Daniel Conrad showed her the prototype, she could instantly imagine buying several for her home and to give to friends. Meanwhile, Scanadu is a VegasTechFund-backed startup doing interesting things in the medical space. The company is trying to make the tricorder scanner from Star Trek. The fund has also invested in Whill, a startup rethinking the electronic wheelchair. These days, talking about hardware inevitably leads to a discussion of the rising popularity of wearable devices. In McCabe’s former startup, she ran tests comparing software in a mobile app and on a wearable and found higher attentiveness among users for the device they wore. “There’s something about [wearables] that makes sense to people intuitively,” she said. When McCabe first got started in hardware a few years ago, she only knew a handful of people with devices like the Fitbit, Nike Fuelband and the Jawbone. Now, it’s reached a point where non-techie family members know about them and are using them. While focusing on an attractive design is important for startups creating wearables, McCabe believes the most important factor is to have a specific customer in mind. McCabe also emphasized the importance of having a “charismatic sales-oriented” founder or CEO during the early stages of a hardware startup because the founder needs to sell the device in every talk, tweet and pitch. For those of you with hardware startups looking to raise money, McCabe said she loves getting pitched, but you’ll want to bring along a prototype. “The most important thing for a startup to know when they pitch me is they should bring the product. I want to get my hands on it. I’ll probably spend the first 15 minutes ignoring what the founder is saying playing with it to get a feel for it. The primary referral method for the fund is through founders of other portfolio companies, but she also connects with startups based on her contacts from her time with Y Combinator and Tech Stars. Other investors also make introductions in order to get the team’s feedback on whether a company’s product is feasible. Still, McCabe also said she randomly comes across projects on place like Kickstarter and will reach out to the founders directly. The availability of resources for early stage hardware startups is still woefully limited, but McCabe and VegasTechFund are doing their part to change that. With enough help, we may soon be saying that hardware eats the world.